The design of the 1946 Hallicrafters SX-42, by famous industrial designer Raymond Loewy, was the first electronic device to win an international design award from New York's Museum of Modern Art according to an article by Gerald Schneider in the June 1996 Antique Radio Classified. The SX-42 is a single conversion general coverage receiver for AM, CW and FM. It fully covers 540 KHz to 110MHz. Bandspread is calibrated for 80, 40, 20, 10 and 6 meters. Top of the Hallicrafters line for 1946, the receiver covered both the old and new FM bands and was intended for both communication purposes and for listening to quality sound on the FM broadcast band. The first ad in Radio News appears in the October 1946 issue. An article on the new radio titled "Designing the PostWar Receiver" also appears in that issue and was written by Bill Halligan W9WZE (Halligan is the "Halli" in Hallicrafters) and Cy Read W9AA. A review by QST magazine can be found in the May 1947 issue, pages 48-49. The review notes that it has a "dual-identity" as a home broadcast and as a communications receiver. The IF section is automatically switched using 455 KHz for the lower four bands and 10.7 MHz for the upper two bands. The upper two bands are noted by the QST review as having an IF passband too wide for amateur communications but providing suberb FM broadcast reception. Using 15 tubes including a pair of 6V6 for 8 watts of push-pull audio output, the set is designed for high fidelity when listening to FM but offers six bandwidth selections for various communication needs. Like other Hallicrafters with the "X" in the model name, the SX-42 is equipped with a crystal filter. This SX-42 had been used in a rack-mount configuration, believed to be a broadcast station monitor. I was able to locate a cabinet for it. The S-meter on this example is a non-original replacement. Compare it with the picture below cropped from the cover of the March 1947 Radio News magazine. After my unsuccesful search for the proper S-meter like that pictured, I received one from Dave K4EWC. Thanks for helping me restore this set, Dave. Dave is looking for a B-42, the elusive adjustable base for the SX-42. If you have one for a reasonable price, let me know and I will contact Dave. The bass-reflex R-42 speaker was designed as a match for this receiver. The PM-23 speaker shown in the Radio News picture is typically thought of as a match for prewar Hallicrafter radios (see the SX-28 ). The device on top of the SX-42 is the SP-44 Skyrider Panoramic display. The SX-42 appeared in the movies in 1953. 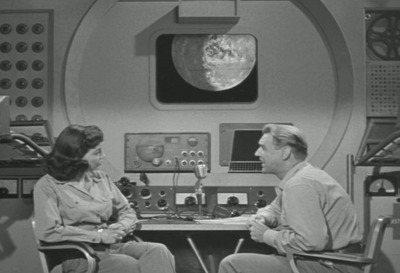 Check out the Moon Rocket console in "Cat Women of the Moon" The speaker shown in the movie is the correct R-42.